The PBS show, History Detectives, has completed filming an episode on Silas Chandler in West Point, Mississippi. A few weeks ago I mentioned that I would be taking part in this show, but I recently learned that producers decided to take the story in a different direction and would not need my assistance. I was a bit disappointed, but ultimately I just hope they get the story right. Well, I have it on good authority that not only did they correct the mistakes made on the Antiques Road Show episode, but that investigators uncovered additional material that puts the nail in the coffin of the story that the Sons of Confederate Veterans and others have spread on their websites and other materials for years. The show is scheduled to air in July or August. Sounds like PBS did some real digging. Cancel their funding at once. Here’s a case in which a book that has gone through the university press vetting process (hello, you professional CW historians) has emerged with information intact that we know to be wrong due to the work of a certain blogger (take a bow, Andy Hall). Now that book makes it out into the public space, with its flawed description now known to readers of this blog (and those readers include advocates of the black Confederate tale, who make it their business to keep an eye on what appears here). Now, let’s apply some of what we’ve heard here over the past several days to this information. Should Kevin have even mentioned it? Good question, because now many people know what few people would have known before. His mentioning of the error thus increases its circulation, and we can rest assured that down the road the BCM crowd will cite this book in support of their tale. Should Kevin have ignored it? There’s been a line of argument offered here which comes across as follows: don’t challenge the alleged facts, but challenge the narrative that those alleged facts serve while letting pass the alleged facts. I’m not sure why one can’t do both, but that’s what I’ve read here. Apparently, challenging the alleged facts acknowledges their existence, but ignoring or stipulating those alleged facts is seen by some as a superior approach (I can’t understand how stipulating them does not also acknowledge them, or how ignoring them may not be taken as conceding their essential truth). So, folks, say someone presented this book to you. It’s been vetted by a university press. What happens when someone says, “See? It’s right here! Even one of those presses favored by those ‘professional CW historians’ says it’s true!” What do you do? How do you respond? Thanks for the comment, Brooks. I have refused to get bogged down with the question of how my posts either help or hinder the dissemination of the black Confederate narrative through various channels. To be completely honest these questions, along with the subtle distinctions suggested in the previous post, hold almost no interest for me. We’ve already seen that this narrative is not confined to a fringe element within the Civil War community. It made its way into a public school textbook and at least two National Park Service exhibits, both of which have been challenged on this blog. See http://cwmemory.com/2010/08/26/the-national-park-services-black-confederates/ and http://cwmemory.com/2010/12/28/the-national-park-services-black-confederates-part-2/ This site was instrumental in bringing about the removal of these inaccurate public displays. I don’t make it my business to try to limit discourse among professional historians nor have I tried to suggest boundaries for more popular discussions. Individual readers are free to interpret what I’ve written in any way they choose. That is not my responsibility. I agree with you. Somehow this notion of criticizing people who attack inaccurate information and the claim that responding to it legitimizes or acknowledges it strikes me as bizarre, especially if one saw it as a general rule transcending this particular issue. I have far greater difficulty with stipulating it as true except for the sake of argument. As for the rest, I welcome comments about what I’ve actually said, and I note that it was not “professional CW historians” but a blogger, you, who addressed several of the matters of misinformation mentioned above and helped secure a change. But I am interested as to how other people would respond to the hypothetical I’ve raised. It seems to me that we could equally apply these questions/concerns to someone like David Barton, whose butchering of American history is part of a broad claim that the United States was founded as Christian nation. I have no problem with academic historians taking various steps to challenge his claims. I don’t need to know anything about the collective profile of those who read Barton or whether those challenges will result in the further dissemination of those ideas. How many of us conduct extensive polling or interviews of our students before we offer legitimate challenges to certain beliefs? I believe it is the UDC that issues these crosses. Now you and Brooks can parse what “veteran” means. You really will go to any length to protect this ridiculous narrative. The site that I link to may be wrong, but I will leave it to you to offer an interpretation of a war veteran that covers those who were not soldiers. Go for it, Border. Gee, BR, are you now claiming veteran status for people who did not serve as soldiers? What does “veteran” mean to you? The status is nothing more than a means to an end. It has no meaning since it can be applied by anyone to anyone. I guess the slaves who fled their masters during the war must be considered to be traitors to the Confederacy. Better yet … BorderRuffian now quotes himself as evidence that he is correct. So now we have someone who quotes himself as proof that the term “veteran” is meaningless. Wow. They definitely failed the “Loyal Slave” test and won’t be getting their likenesses on any Confederate monuments. 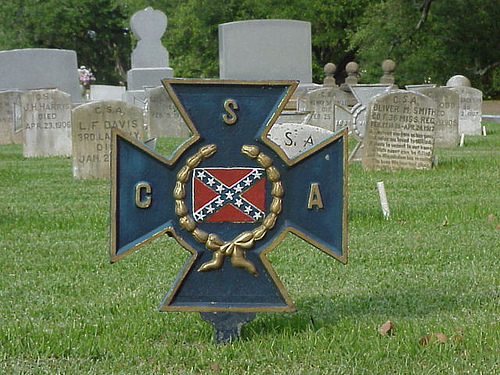 Preston Roberts (slave cook) was the first black to receive the Southern Cross of Honor. So, it sounds like this distortion of the past has a rich history. There’s a single paragraph in Hattaway and Jones that is sort of a throwaway re AAs “serving/fighting” in confederate ranks that appears as sort of a mangled reference to the Louisiana Native Guards certainly should be re-written in any future edition. I look for this sort of thing, and part of my interest in it is based on Kevin’s work. He deserves a lot of credit. Thanks TF. I appreciate the kind words. I wonder if there’s a bulk rate available on Dew’s “Apostles of Disunion” for some of these folks who advance the BC myth…I’m sure they’d ignore it, but still; pretty much demolishes the central concept they are trying to use the BCM argument to advance. Not really. They just insist on an absolute distinction between secession in the Deep South, and the later border state wave, which of course had nothing to do with the debate over how best to protect slavery. Okay, I’ll throw in a copy of Manning’s “What this Cruel War Was Over”…2 for 1 deal. TF, I recently suggested to one advocate of BCS that he look at the writings of Wesley, Wiley, Levine and Manning, who have all dealt with the employment of African Americans in Confederate war effort, and was told in response that he (1) didn’t know any of those authors, and (2) would not be reading them anyway, given that my recommendation of them proves their unreliability. So that’s the mindset one frequently deals with. Oh, it is definitely a “faith-based” myth, certainly…maybe if we wrapped a book jacket from “The South was Right” around Manning? Seriously, how do they regard Dew? As a heretic? The LNG story illustrates how it is possible to make a statement that is not strictly false but conveys a falsehood. As I understand it, the LNG were never mustered into the CSA but as Louisiana militia were mobilised for the defence of New Orleans, where they went over to the Union en masse at the first opportunity. So if a “Black Confederates” advocate said that all those free African Americans “served in the Confederate armed forces” it would be true for the interval between mobilisation and going over to the Union. I dare say a lot of BC statements are like that. The LNG story illustrates how it is possible to make a statement that is not strictly false but conveys a falsehood. . . . I dare say a lot of BC statements are like that. Exactly so. There are a lot of “truthy” claims of that sort. When you combine that with intentionally vague terms like “served,” and gloss over the fact that most men identified as BCS were slaves (and had all the issues of self-agency and threat of coercion that goes with it), you get a warm, fuzzy and simplistic story about the brotherhood of arms, mutual respect and shared loyalty to the Confederate cause. It’s a happy cartoon. Um, lets see….last I checked the only thing the SCV has done in regards to Silas Chandler was tell the story (from both the ancestors of Chandler and his master respectively) of two boys who served together, and how Chandler looked after the wounded master…a service that happened more than just a few times in the course of the war. Those are the simply, undisputed facts…ones even you cannot refute. Beyond that I do not see a conspiracy on our part….of course I do not have the mentality of a 9/11 hoaxer or a Birther either. It sounds like you’ve done the necessary research to make such a claim. Please provide the primary source material that supports your preferred claim about the relationship between Silas and Andrew. I look forward to your response. I’m sure my ancestor’s slaves looked after him when he was sick, too. I fail to see how your argument adds anything to your contention that Silas Chandler was more than slave, forced to serve his master. This is business as usual for Carl. Doing history involves nothing more than making an assertion. As far a I know, Carl has not done any research on the subject of the Chandlers so his claim is meaningless. (from both the ancestors of Chandler and his master respectively) You need to clarify that statement with the fact that there are only a couple of ancestors from both Chandler families that tell this story. I wouldn’t anticipate a response from Mr. Roden. He is clearly not familiar with the relevant evidence surrounding this story. As a great great grandson of Silas Chandler, I want to say THANK YOU to Kevin Levin, Myra Chandler Sampson, and PBS for doing the hard work to find the truth. After all, thats what matters, regardless of your politics. I hope this will be an opportunity to bring ALL sides our family closer together, in West Point Mississippi and across the world. I discovered the Chandler Boys photograph in 1980, when AMERICAN HERITAGE magazine included it in a feature for the then just released THE IMAGE OF WAR 1861-1865 series of books published by the National Historical Society. The picture was captioned “Andrew Chandler brought his slave Silas Chandler with him [to the war].” I saw this image long before GLORY, though I also had seen a few images of Black Union soldiers by that time. Anyway, since 1980, Silas Chandler has gone from slavery to being the literal poster child for enlisted, willing Black Confederate Soldiers, fighting side-by-side with White men who accept them with no problems. This photograph is too good and the Black Confederate thing has grown too large for it to ever completely be put to rest. Even after watching this, some will still insist the man must have been a combat soldier. I’ve always found the Black Confederate Soldier phenomenon fascinating. Whatever their stories were, the individual men seen standing behind their masters, or shown cooking for soldeirs, or slaves seen armed to the teeth like Chandler, I would love to know who they really were, how they thought of themselves and what the Confederates with them thought of them, though that is probably a given. Thanks for the reference, Bryan.